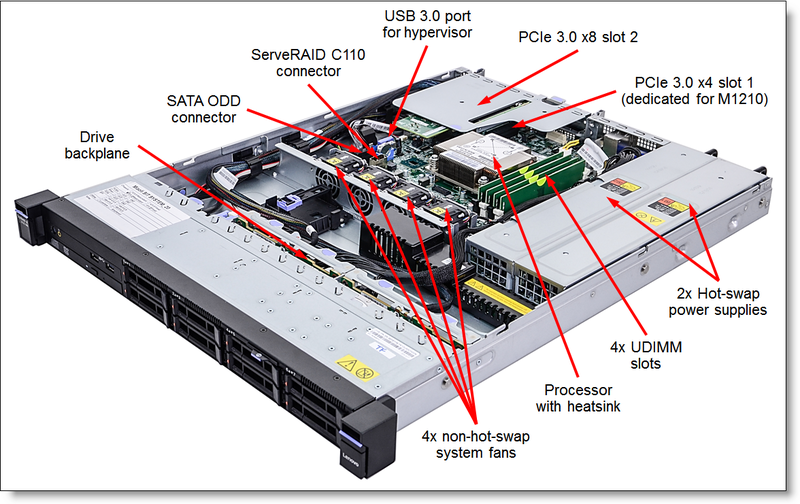 The System x3250 M6 offers a wide range of processors — from Intel Celeron to Intel Xeon E3-1200 v5. With support for a memory capacity of up to 64 GB and internal storage of up to 32 TB, the x3250 M6 is ideal for small- to medium-sized business, workgroups, distributed locations, and webscale workloads. Flexible and scalable internal storage configurations provide up to 32 TB of storage capacity in a compact 1U form factor. Network interfaces 2x integrated Gigabit Ethernet 1000BASE-T ports (RJ-45) with the onboard Intel I350-AM2 controller; one port is configured as a dedicated or shared management port. Rear: 2x USB 3.0, 1x DB-15 VGA, 1x RJ-45 GbE network, 1x RJ-45 GbE shared network/systems management or dedicated management ports. Optional 1x DB-9 serial port. Security features Power-on password, administrator's password, Trusted Platform Module (TPM) 2.0 (hardware) / 1.2 (firmware). Optional lockable front bezel. Operating systems Microsoft Windows Server 2012, 2012 R2, and 2016; Red Hat Enterprise Linux 6 (x64) and 7, SUSE Linux Enterprise Server 11 (x64) and 12, VMware vSphere (ESXi) 5.5 and 6.0. Product availability: Standard models of the System x3250 M6 are not available in North America. Note: Power cables are not included (except for the models 394316A and 363316A); see Power supplies and cables for ordering information. # Onboard software RAID controller. The System x3250 M6 has a one-year (Machine Type 3943) or three-year (Machine Type 3633) warranty with 24x7 standard call center support and 9x5 Next Business Day onsite coverage. Also available are Lenovo Services warranty maintenance upgrades and post-warranty maintenance agreements, with a well-defined scope of services, including service hours, response time, term of service, and service agreement terms and conditions. RTS provides comprehensive technical call center support for covered servers, storage, operating systems, and applications. Providing a single source for support of hardware and software issues, RTS can reduce problem resolution time, decreasing the cost to address technical problems and increasing uptime. Offerings are available for Windows, Linux, VMware, Microsoft business applications, Lenovo System x storage devices, and IBM OEM storage devices. The following table lists the 6 Gbps SAS external drive enclosures that are offered by Lenovo that can be used with the System x3250 M6 for storage expansion. The following table lists the external storage systems that are currently offered by Lenovo that can be used with the System x3250 M6 in storage solutions. The following table lists the Ethernet LAN switches that are offered by Lenovo that can be used with the System x3250 M6 in network connectivity solutions. The following table lists the Fibre Channel SAN switches that are offered by Lenovo that can be used with the System x3250 M6 in FC SAN storage connectivity solutions.